We just returned from our long awaited vacation in Puglia this past weekend, and although we had a wonderful time initially, things ended up much differently than we had planned. 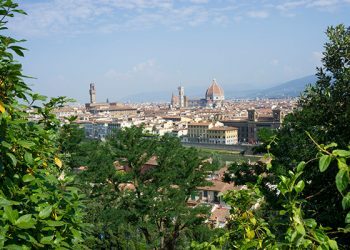 One never knows what may happen when you plan a vacation months in advance, and unfortunately for us, although we rarely get ill, we were both knocked sideways with a very nasty flu bug causing us to cut our trip short to return home to Umbria. I had been planning this trip for over a year and was so excited to be spending an entire week in Puglia……. I guess we will just have to plan a return to Puglia in the near future so we can complete our trip! I honestly do love Puglia, and if we hadn’t picked Umbria as our perfect place to live, then Puglia, at least for me, would be my next choice. 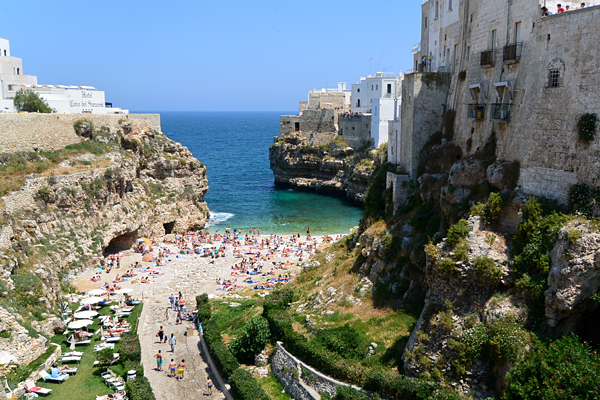 Puglia, or Apulia, is often referred to as the “heel” of Italy because of its geographical position. Much of the region is lined by the sea which is one reason we love it as fresh seafood is plentiful and relatively inexpensive as well. Although I do consider our life in Umbria to be rather laid back, the Pugliese give a whole new meaning to slow paced and relaxed . Perhaps it is all that sunshine and sea air! 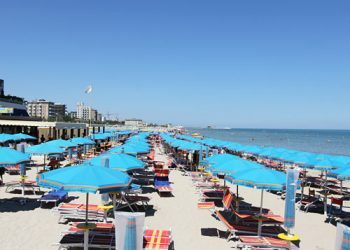 In the past 10 years or so since we first started to visit Puglia, we have seen a rather rapid increase in the number of tourists that visit the region although compared with such regions as Tuscany or Veneto, you still can travel to many beautiful small towns in Puglia and not come across any (or very few) foreign tourists. 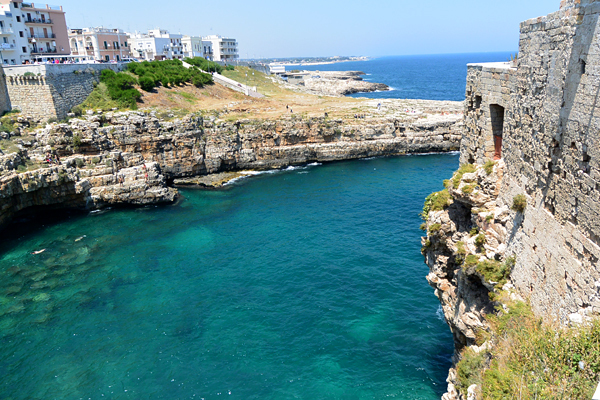 We seem to visit Puglia every two years or so, and although there is still much of the region left for us to explore, after visiting both small coastal and interior towns, we truly prefer the quaint towns by the sea such as Polignano al Mare, Monipoli, Otranto, and Gallipoli. 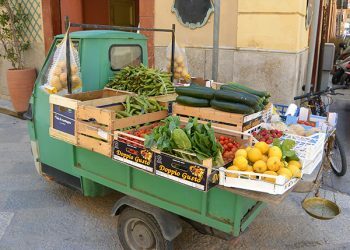 The cuisine of Puglia relies heavily on it’s locally grown agricultural products and abundant fresh seafood, is rich in tradition, and quite unique in flavor as well. Every town seems to have their own regional specialty foods, and homemade pasta of every shape and description can be found across the region. Although I truly love the food of Umbria, it is always enjoyable to visit another region such as Puglia where the food is so uniquely different from ours. Being a very food centric family, we always plan our vacations around food, making Puglia a great vacation destination for us. 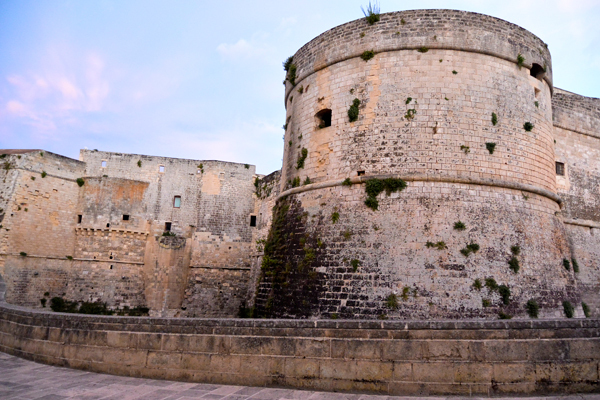 The Outer Walls of Conversano – The older section of Conversano is now traffic controlled and you must park outside and walk in. Since our hotel was inside these walls it was a little tricky, but worked out just fine in the end. Day Two – Upon arising the next day, our next stop was Monipoli, a walled seafront town that we really never explored before. 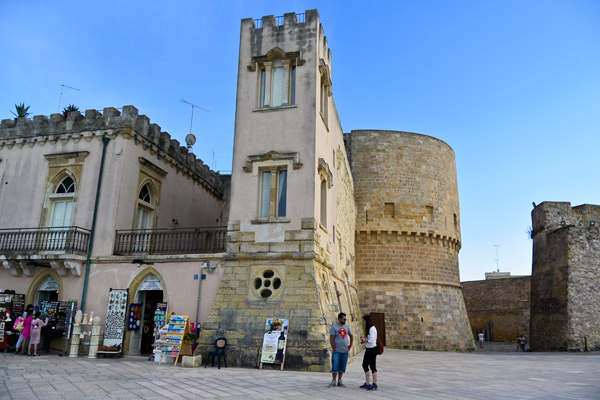 We headed into the city center and found a place to park and then wandered throughout the town, particularly enjoying the seaside walk and historical center. Definately a town I’d recommend visiting! There were many historical churches hidden into tiny streets within the historical center that would be worth visiting, and the cathedral originally was built in the 12th century but was completely overhauled in its now Baroque style in the 18th century. 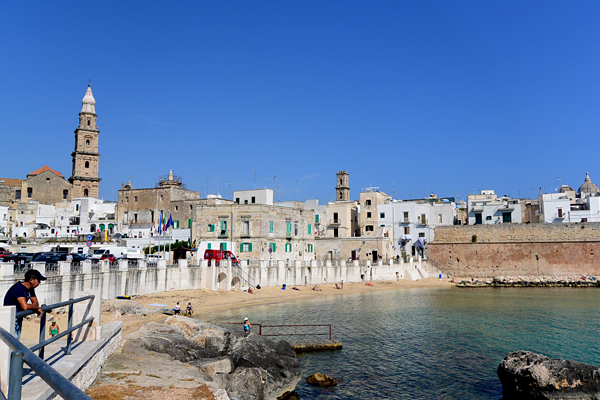 There is a walkway along the sea in Monopoli, and a few small beaches tucked in here and there around the town. 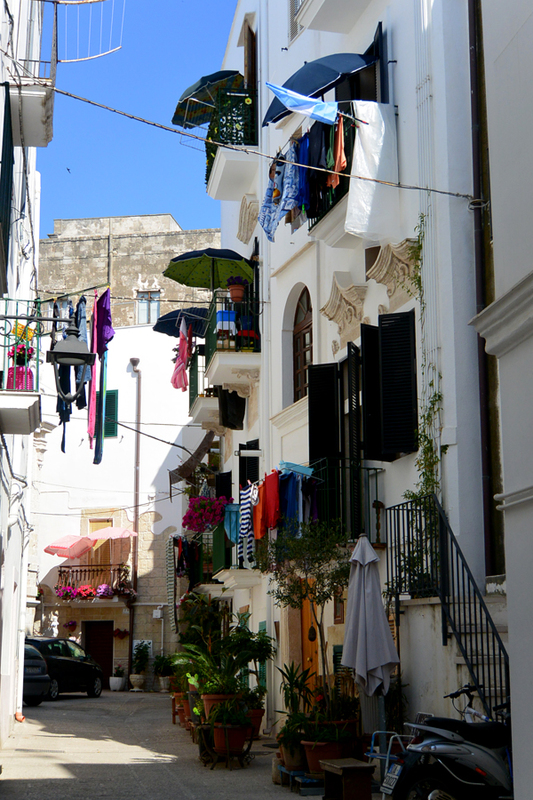 A typical tiny street in the historical center of Monopoli packed with vehicles, flowers, and of course the usual clotheslines packed with laundry drying in the sun. The castle at the point. The town was extremely clean throughout, and they were doing a casting call for some television show within the castle the day we were visiting. Killing time before lunch, we drove down the coast and stopped in Savelletri, a small fishing town. 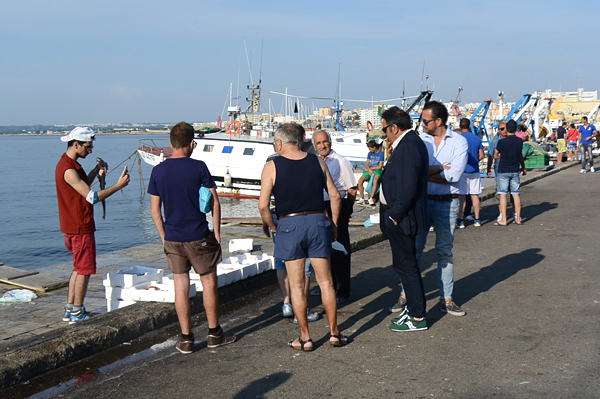 It was the day off for the fishermen, and many were sitting around the docks repairing their nets. Strange as it may seem, this is perhaps our favorite place to dine in Puglia, and we often plan our trip around it. It is obviously not much to look at, you sit at plastic tables and use plastic plates. It is a small family run place that we discovered it years ago by chance but you honestly get the freshest, tastiest seafood at very low prices here. 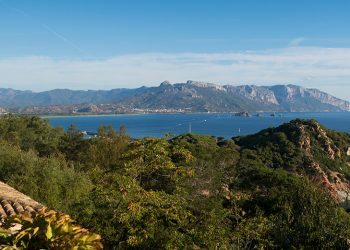 We never seem to remember exactly where it is located, but it is between Torre Canne and Savelletri on a rather isolated piece of the beach. 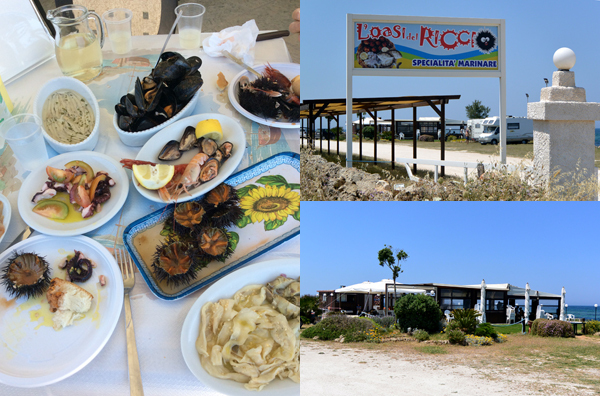 There are other “fish shacks” in the area, but we love this one and I would highly recommend L’oassi di Ricci. We usually just ask them to bring us appetizers and then call stop when we cannot eat another bite. Two of my favorite items here are the tiny calamaretti (tiny squid) about the size of my thumbnail that are deep fried and the grilled octopus which is one of their specialties. 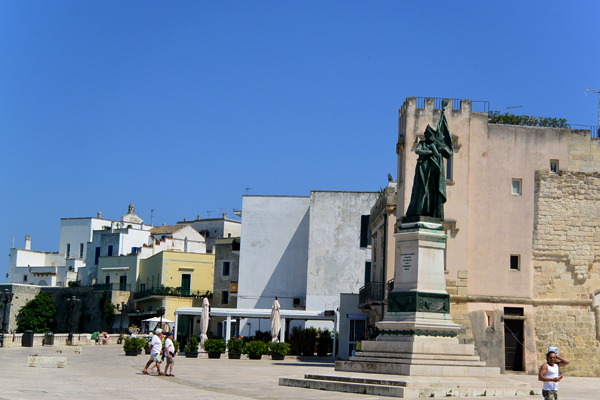 After lunch, we headed to our stop for the evening in Ostuni. 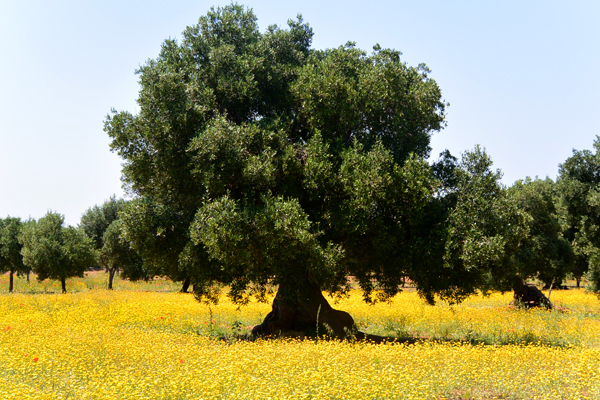 The area around Ostuni has the most amazing ancient olive trees that are hundreds, if not a thousand years old. This one field we passed was covered in wildflowers that just seemed to set the trees off perfectly. I must admit, having our own 100 olive trees that I cannot help but admire these old trees and usually come home with dozens of photos of olive trees! 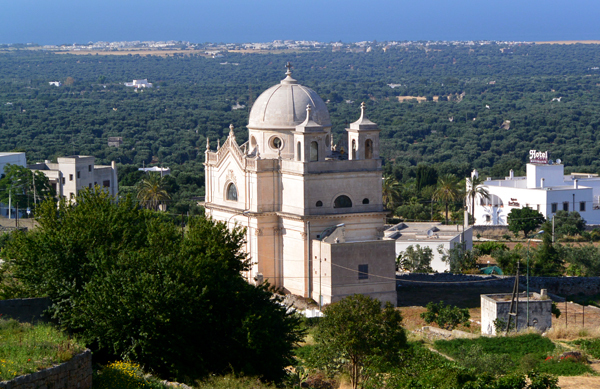 A view looking towards the sea from Ostuni. 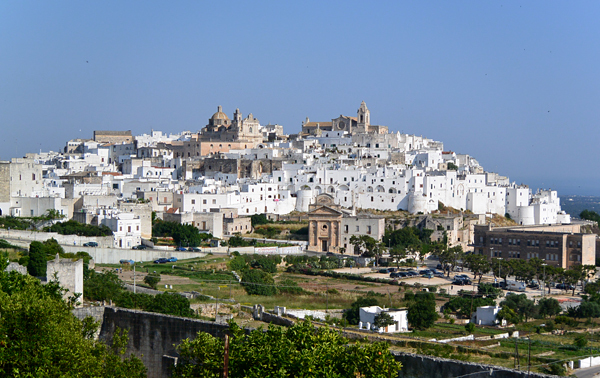 The whitewashed city of Ostuni, one of Puglia’s better known toursit destinations. 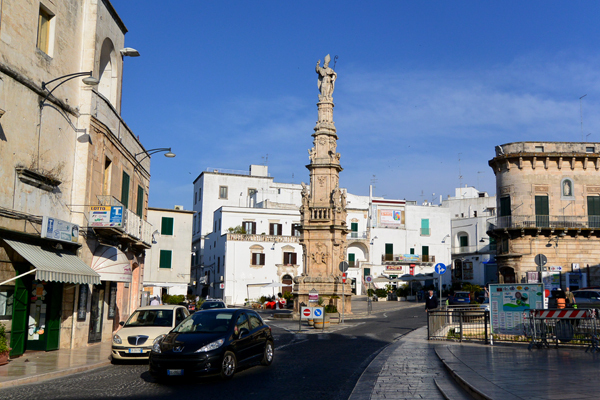 You will see many more tourists in and around Ostuni. 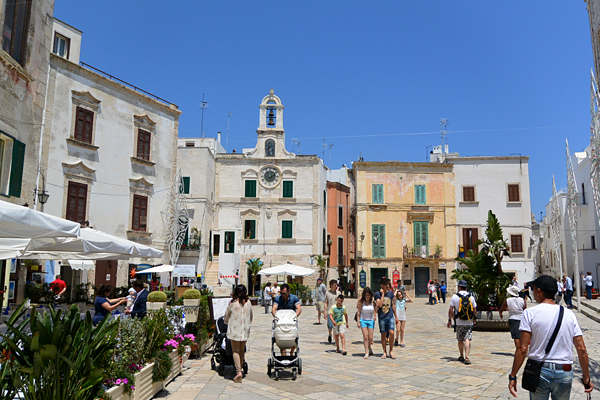 Walking through the streets of Ostuni, stopping for a gelato or an afternoon drink……. 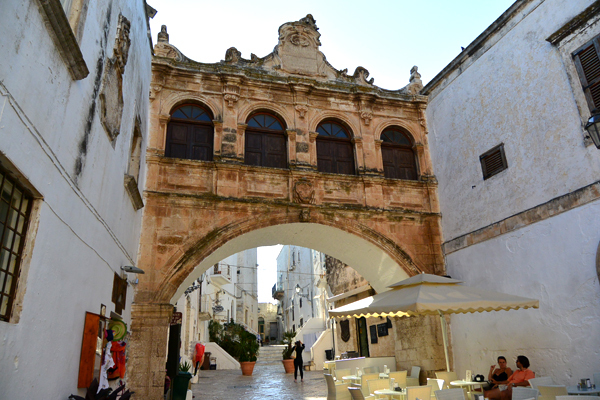 Ostuni is a great central place in Puglia to stay. We booked a week in a lovely property just outside the city with our entire family years ago, and then took day trips to explore the neighboring towns. 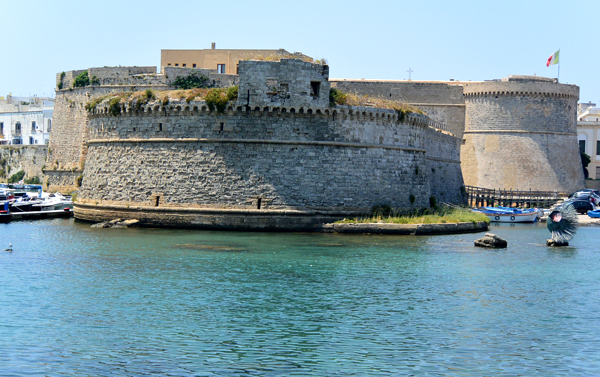 Day Three – We were heading to Otranto for our third stop, another one of our favorie seaside towns, but since it isn’t too far from Ostuni we decided to stop in Lecce along the way. 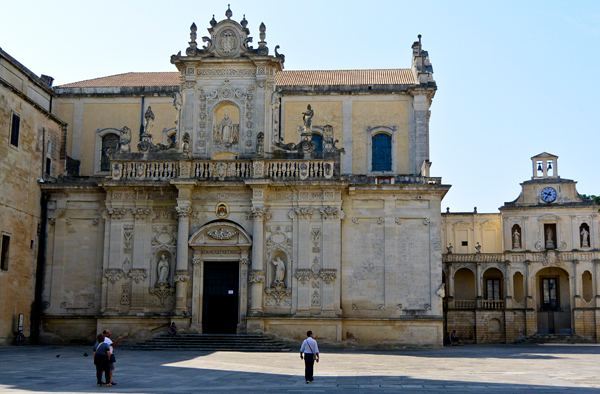 Our initial plan was to have lunch in Lecce but we are early risers and had explored Lecce as much as we wanted to by 11am. As restaurants do not open for lunch before 1pm we decided to head down to Otranto and have lunch there. 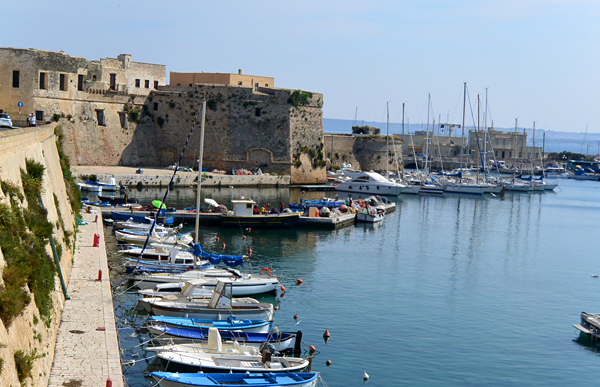 Arriving in Otranto, we parked outside town and ate at Ristorante dal Baffo, a family run place we had enjoyed in the past. Check-in at most hotels in Puglia is after 3pm so a leisurely lunch was the perfect way to spend the time. From 1pm until 6pm very little is open in most towns in Puglia as folks enjoy their large meal at lunch, take a siesta, then head back to work for a few hours later in the day. We dined at the family’s other restaurant in town called L’altro Baffo run by the daughter in the evening. It is much more elegant and modern although the focus of the menu is always Pugliese. 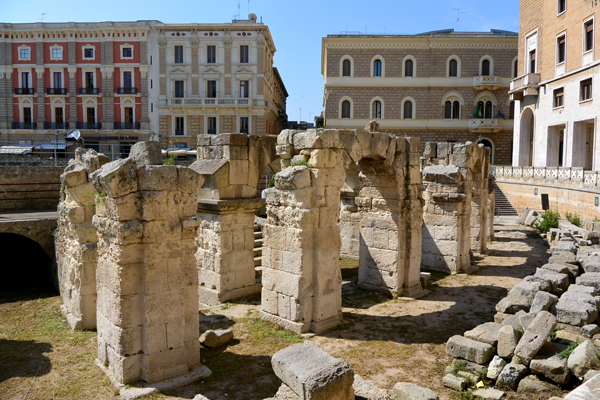 The ruins in Lecce are quite amazing and the bustling city simply runs around them. 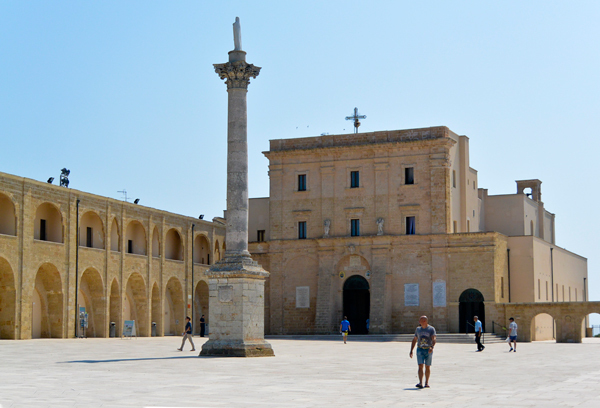 Piazza Duomo in Lecce – Known for its beautiful Baroque architecture, Lecce is a great city to visit on your trip to Puglia. The castle in Otranto at sunset! Day Four – Our fourth night was planned for Gallipoli. We were now moving much slower as my husband had become ill by this time and I was driving. We still visited the sites we had planned to along the way, although it was just myself and small dog Luca who got out of the car to explore. 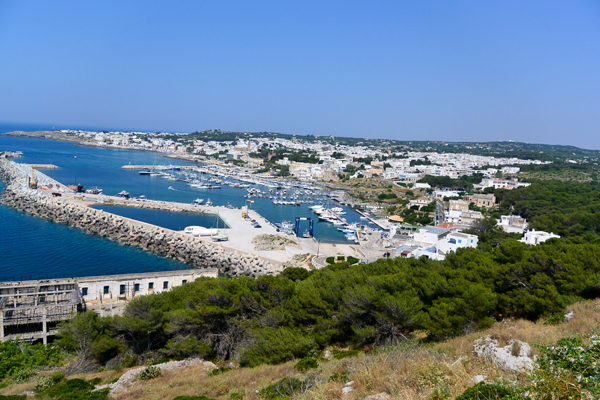 We stopped at the sanctuary of Santa Maria di Leuca as well as the southern most point of Puglia. 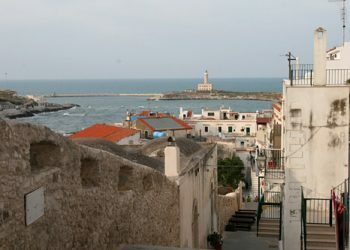 The view of Leuca from the sanctuary looking down the coast. 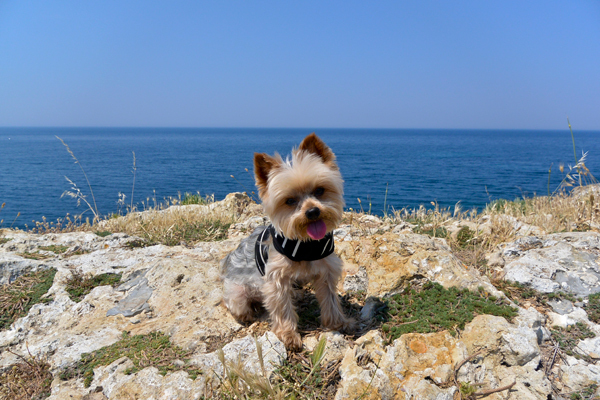 Luca at the southern most point of Puglia. I had no one to take my photo, so took one of Luca instead. He wasn’t impressed. The grotto next to the southern most point. 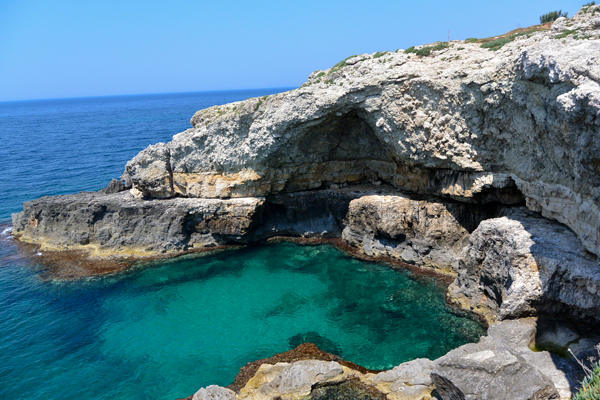 The coast of Puglia is very rocky, the waters crystal clear and colored in varying shades of blue. 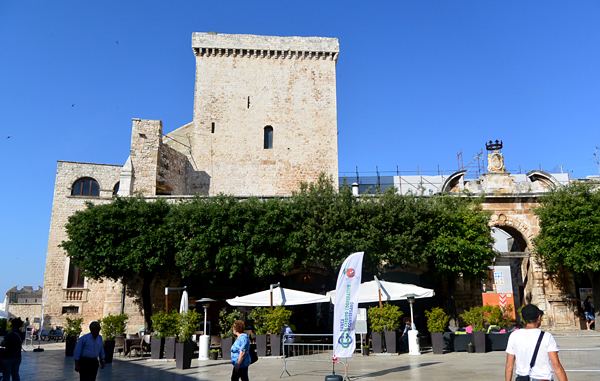 The seafront castle that sits right at the entrance to the old town on the other side of the historical bridge. 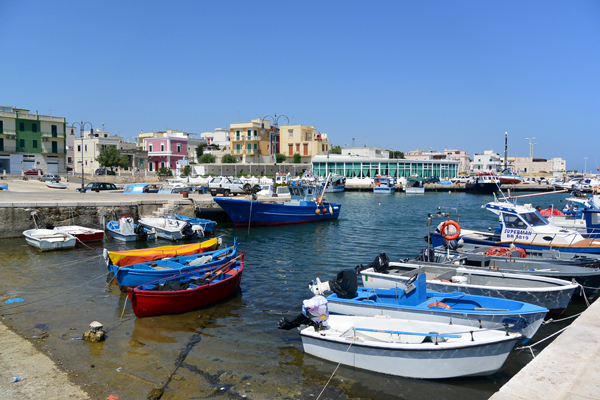 One of our favorite things to do in Gallipoli is to visit the docks when the fishing boats come in. Hundreds of folks run from boat to boat to check out the catch of the day and haggle over prices. 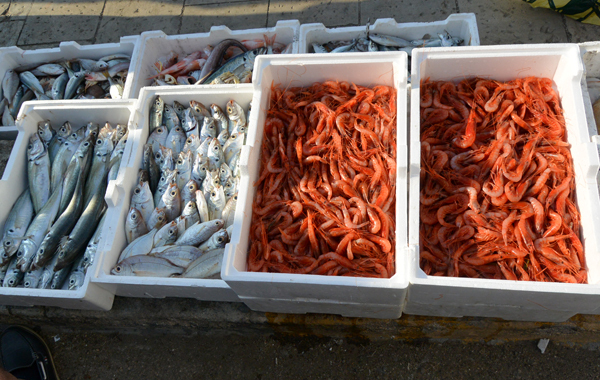 Cases of fresh seafood offered for sale. Some boats were selling an entire case of shrimp for 10 euros! Walking through the old town looking towards the docks. Early morning, the fishermen were all out on the docks repairing their nets. 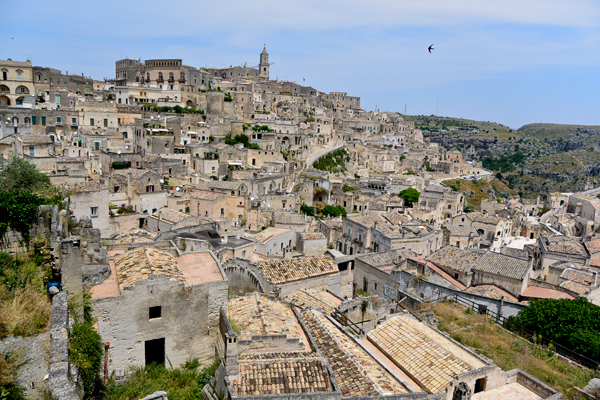 Day Five – Our next stop was Matera in Basilicata as we were now looking to head back north. We arrived there late morning and after some difficulty, we managed to find our hotel which was built into the caves of the Sassi. We wandered around town briefly before heading for lunch, and that was where my trip ended. Becoming ill immediately after lunch, I barely saw much of Matera, and the next day upon arising we decided we needed to cut our trip short and head home for us both to recover. Although I do recommend visiting Matera, I only have a few photos taken while I was able to, so it is another spot I’ll need to return to! 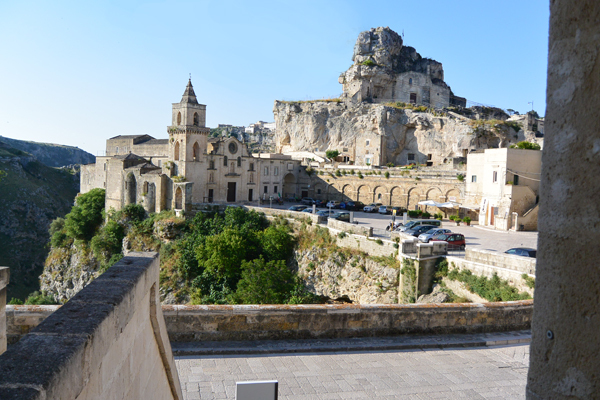 The view from our hotel room in Matera. Luca climbing in an olive tree that is hundreds of years old. 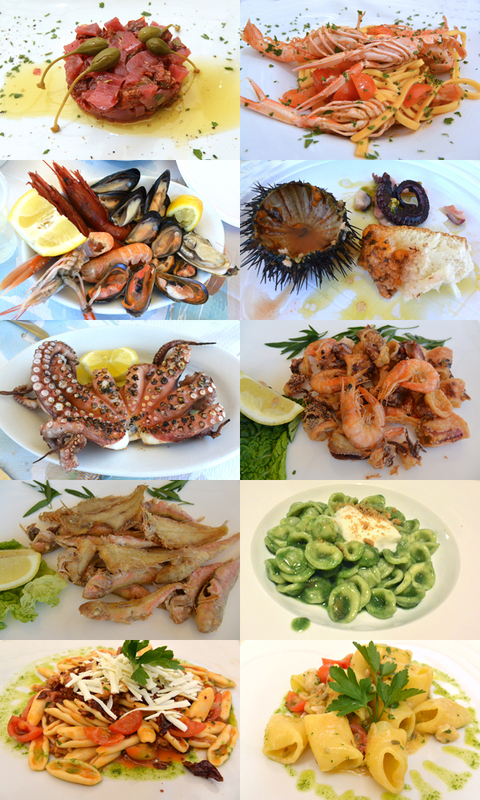 Some of our favorite dishes enjoyed in Puglia on this trip! I am including the places we stayed as well as some of our favorite restaurants. You can see that on the last couple of days before we called it quits, neither of us was really interested in fine dining! The adorable Luca has stolen my heart. Your photos are wonderful thank you so much for sharing. Your part of the country looks so beautiful. I have only spent time on the coast of Amalfi and in Tuscany. And of course a shopping trip to Florence. I hope to get back to Italy some day. I just loved it there. So sorry you took sick and had to cut your trip short. Thanks Maralyn! I’m feeling much better now and am back in the kitchen!! My husband and I just got back from our Italy trip. Looking forward to going back! Had such a wonderful time! How absolutely beautiful Deborah! Thank you for sharing your adventures with all of us here in the US..how I long to go back to Italy one day! Can’t wait to hear about all the wonderful recipes you will have developed from your journeys! Ciao Bella! 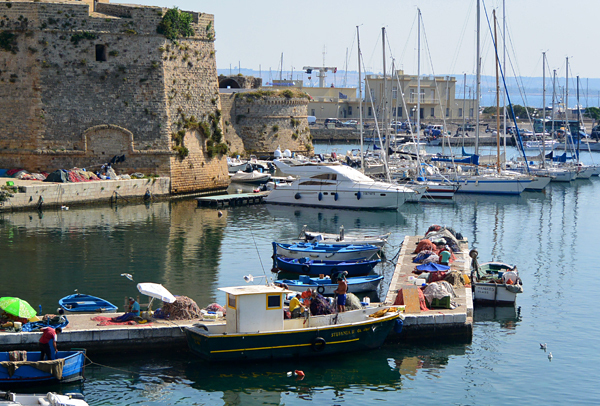 Deborah, I so enjoyed reading of your trip to Puglia. I also am sorry you took ill, but your pictures were just beautiful! I enjoyed revisiting Puglia, I was there many years ago. I lived in the Veneto region (Vicenza) for 18 years and miss it very much. You do such a wonderful job giving us information of where to visit, to eat, etc. I can’t wait to see where you go next! 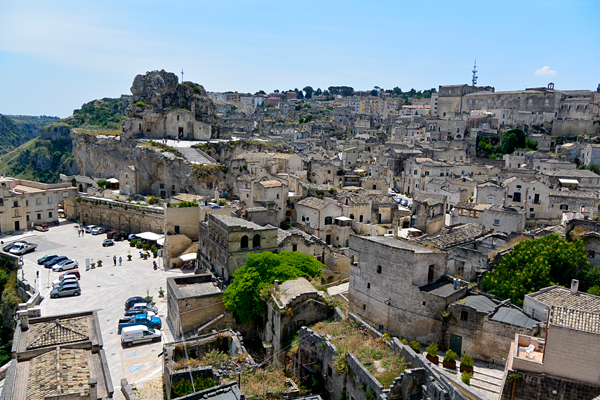 Absolutely fabulous blog about Puglia, Deborah. the photos and all the information you share is invaluable. I wonder if you might be able to help me. About 20 yrs ago while visiting with my mom, her families in Montefusco, I took a day trip with my Uncle and two cousins to Puglia. We returned with bushels of sundried tomatoes which were then soaked overnight in red wine, squeezed dry the next day then packed with olive oil, basil and some garlic Divine ! I do not remember which town or city we visited and I’m wondering if you might have a clue or any information you could share? Bianca, I know that many folks in southern Italy sun dry their tomatoes, I do not think it is any specific town in Puglia. Wonderful post. 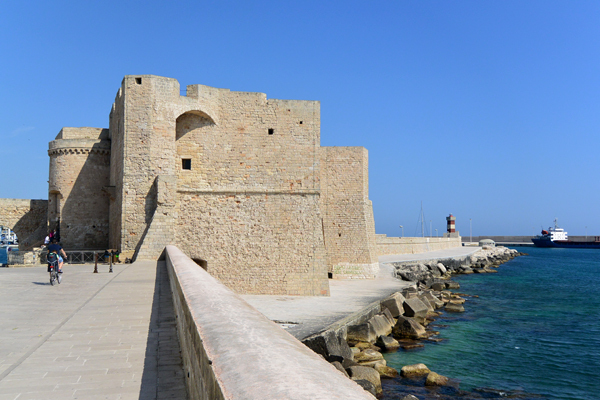 We also recently returned from Puglia, and loved it. This time it was a tour, but we definitely plan to go ahead on our own for a more leisurely trip. Love your recipes too by the way. 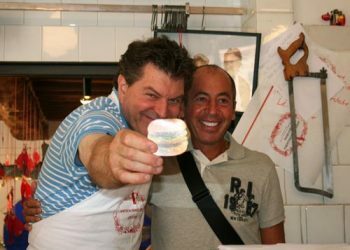 I kept thinking what a fabulous cooking class “the foods of Puglia” would make. I used to teach classes based on places we visit. Ciao! Good morning, although I know it’s afternoon in Italy! I thoroughly enjoyed reading about your trip to Puglia. I was born in a small town near Benevento and love the olive trees and vineyards that are so prevelant in my region. 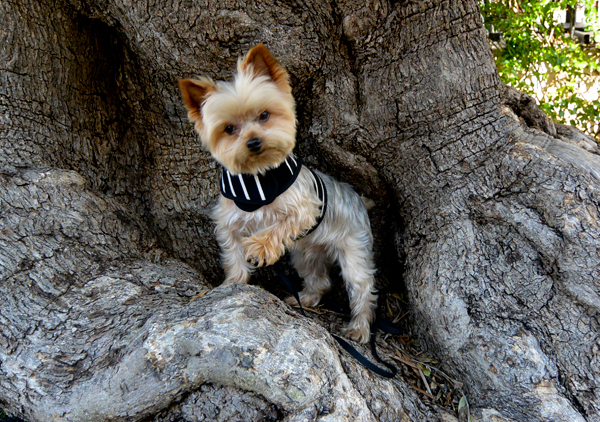 So I can understand why you love taking pictures of the trees! 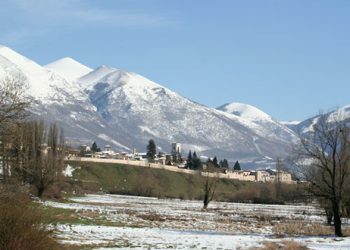 Maybe some day you can take a short side trip and visit Benevento, home of the liquore/torrone “Strega.” This liquore is used in many dessert dishes in our region. We are also known for our cavatelli (cicatielli) and mozzarella di bufola. Thank you so much for this blog. Our family just returned from a 12 day stay in Puglia. We took your advice about LÓassi di Ricci and loved it. The sea urchins were interesting and my grilled calamari was delicious. Thank you for all of your delicious recipes, they remind me of my childhood. Janine, so glad you enjoyed L’Oassi di Ricci. I agree, sea urchins are an acquired taste. Thank you for this beautiful trip through Apulia. My parents emigrated from Casamassima, Provincia di Bari, to America in early 1900s. They met at a concert in Manhattan, NY where dad, a professional “tenore lirico”, was in concert. My dream is to some day go to Italy and travel throughout this beautiful land especially to the town where mom and dad were born.